It’s scary to think that 90% of businesses that lose their back-up data records do not survive in business for another year! 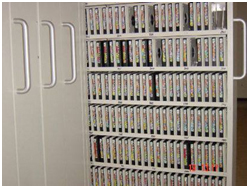 That is why it is essential that you have your media back-up tapes stored securely off-site. That’s where DataSapce UK can help. We have a number of secure storage sites which are out of ‘potential disaster centres’ and exclusion zones i.e. central city locations. Our storage centres meet all compliances and ensure you comply to all the latest laws about retaining back up information for longer. This helps to protect you from data loss caused by virus contamination, systems failure fire, theft and so on. We can get you a clean data cycle as soon as you shout, 24 hours of the day, every day of the year. We barcode all of your media tapes and securely collect and despatch to you using our security vetted staff for your protection. Our team of professional IT specialists will also establish a disaster recovery procedure for you on a complimentary basis. This will ensure that any downtime you experience due to data loss will be minimal. As well as controlling storage temperatures and humidity levels, we have CCTV surveillance, advanced intruder alarms, FM200 gas suppression and smoke detect systems â€“ early warning. Our Media Vaulting Services at DataSpace UK will ensure the complete security of your data. Your data that is irreplaceable and so of great value to you. Of course when your data is finally obsolete and you no longer need to keep it to fulfil your lawful commitment, we can also offer a confidential destruction service.